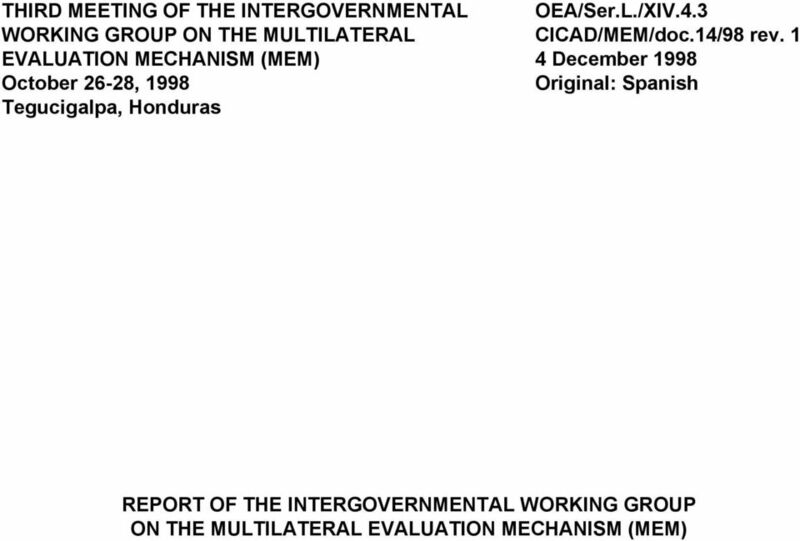 Download "OF THE INTERGOVERNMENTAL WORKING GROUP ON THE MULTILATERAL EVALUATION MECHANISM (MEM)"
3 B. 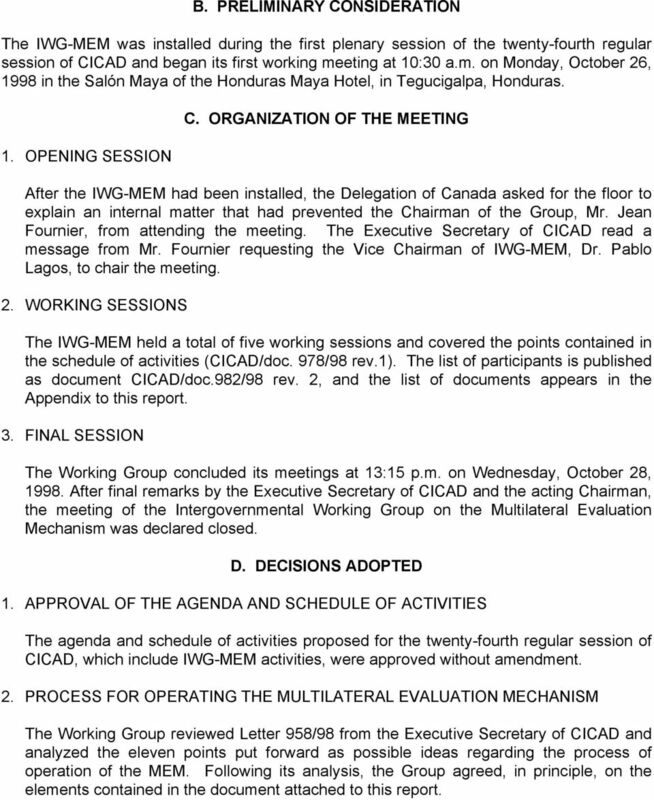 PRELIMINARY CONSIDERATION The IWG-MEM was installed during the first plenary session of the twenty-fourth regular session of CICAD and began its first working meeting at 10:30 a.m. on Monday, October 26, 1998 in the Salón Maya of the Honduras Maya Hotel, in Tegucigalpa, Honduras. 1. OPENING SESSION C. ORGANIZATION OF THE MEETING After the IWG-MEM had been installed, the Delegation of Canada asked for the floor to explain an internal matter that had prevented the Chairman of the Group, Mr. Jean Fournier, from attending the meeting. The Executive Secretary of CICAD read a message from Mr. Fournier requesting the Vice Chairman of IWG-MEM, Dr. Pablo Lagos, to chair the meeting. 2. WORKING SESSIONS The IWG-MEM held a total of five working sessions and covered the points contained in the schedule of activities (CICAD/doc. 978/98 rev.1). The list of participants is published as document CICAD/doc.982/98 rev. 2, and the list of documents appears in the Appendix to this report. 3. FINAL SESSION The Working Group concluded its meetings at 13:15 p.m. on Wednesday, October 28, After final remarks by the Executive Secretary of CICAD and the acting Chairman, the meeting of the Intergovernmental Working Group on the Multilateral Evaluation Mechanism was declared closed. D. DECISIONS ADOPTED 1. APPROVAL OF THE AGENDA AND SCHEDULE OF ACTIVITIES The agenda and schedule of activities proposed for the twenty-fourth regular session of CICAD, which include IWG-MEM activities, were approved without amendment. 2. 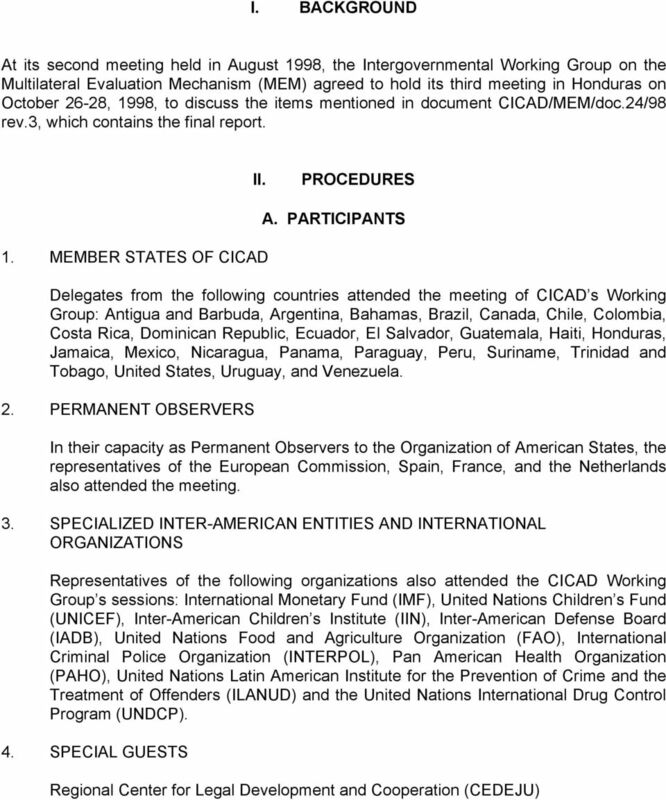 PROCESS FOR OPERATING THE MULTILATERAL EVALUATION MECHANISM The Working Group reviewed Letter 958/98 from the Executive Secretary of CICAD and analyzed the eleven points put forward as possible ideas regarding the process of operation of the MEM. Following its analysis, the Group agreed, in principle, on the elements contained in the document attached to this report. 4 3. CONSIDERATION OF The Group examined the indicator matrix proposed by the Executive Secretariat of CICAD (CICAD/MEM/doc.4/98). It reviewed the indicators referring to the following Goals: 1. Optimizing National Strategy, 2. Preventing Drug Abuse and Treatment of Drug Addicts, and 3. Reducing the Production of Drugs, made comments, introduced modifications, and instructed the General Secretariat to make the changes agreed upon. The Secretariat will forward the matrix with the changes incorporated to member states and will receive any comments on this document that the countries may care to make. 4. OTHER BUSINESS The fourth meeting of the Intergovernmental Working Group on the MEM will be held in Washington, D.C. in the last week in January The Group agreed on an agenda, which includes, among other topics, continuation of the review of the evaluation indicators proposed by the Executive Secretariat of CICAD. 6 MEM PROCESS Questions and answers follow the order in which they were discussed by the Intergovernmental Working Group on the MEM, Tegucigalpa, October 26-28, Would the mechanism develop gradually from a small number of simple indicators to a larger number of complex indicators over time? The process shall begin with simple indicators and progress to more complex ones. 2. 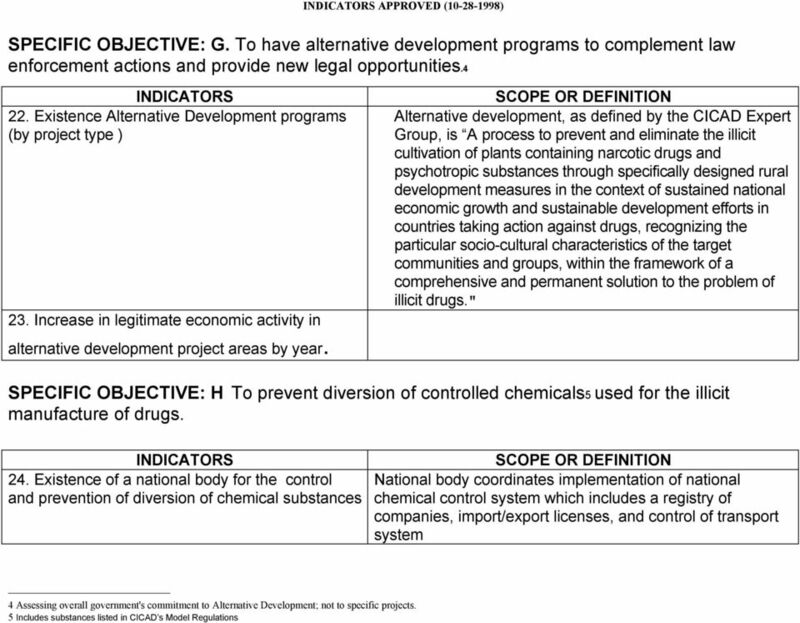 Would the report have a uniform format, observing the outline of the Anti-Drug Strategy in the Hemisphere: general points, demand reduction, supply reduction and control measures? The format of the process shall be uniform and based on the Anti-Drug Strategy in the Hemisphere. 3. 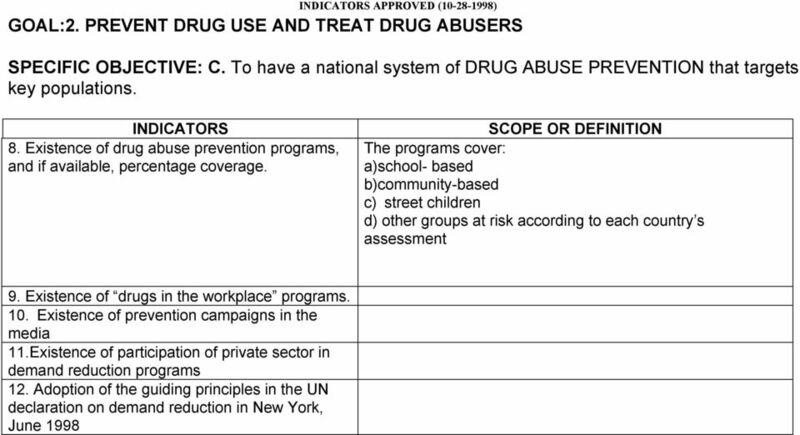 Would the coordinators of the evaluation receive data and statistics from the National Drug Commissions? 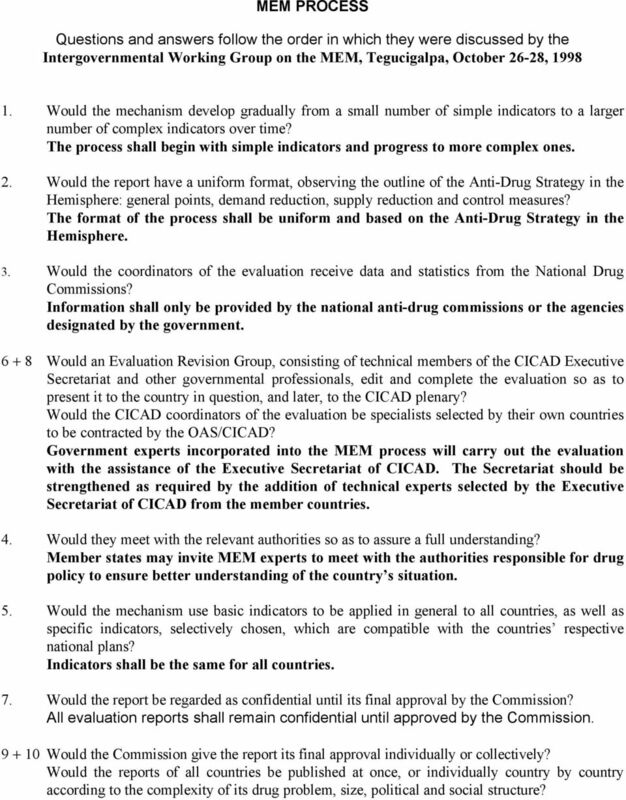 Information shall only be provided by the national anti-drug commissions or the agencies designated by the government Would an Evaluation Revision Group, consisting of technical members of the CICAD Executive Secretariat and other governmental professionals, edit and complete the evaluation so as to present it to the country in question, and later, to the CICAD plenary? Would the CICAD coordinators of the evaluation be specialists selected by their own countries to be contracted by the OAS/CICAD? Government experts incorporated into the MEM process will carry out the evaluation with the assistance of the Executive Secretariat of CICAD. The Secretariat should be strengthened as required by the addition of technical experts selected by the Executive Secretariat of CICAD from the member countries. 4. Would they meet with the relevant authorities so as to assure a full understanding? Member states may invite MEM experts to meet with the authorities responsible for drug policy to ensure better understanding of the country s situation. 5. Would the mechanism use basic indicators to be applied in general to all countries, as well as specific indicators, selectively chosen, which are compatible with the countries respective national plans? Indicators shall be the same for all countries. 7. Would the report be regarded as confidential until its final approval by the Commission? All evaluation reports shall remain confidential until approved by the Commission Would the Commission give the report its final approval individually or collectively? Would the reports of all countries be published at once, or individually country by country according to the complexity of its drug problem, size, political and social structure? 7 A timetable shall be developed for the preparation of the evaluation reports. The draft evaluation report shall be sent to the country being evaluated for comment. The reports shall be reviewed on a country by country basis. A special session of the Commission shall be convened for the consideration of all evaluation reports. At that session, both the draft report and country comments shall be presented to the CICAD plenary. 11. Would the evaluation be a permanent process, together with a CICAD annual report on the progress of countries in dealing with the different manifestations of the drug problem? The evaluation process shall be a permanent one. The frequency of the reports shall not be decided until the first round of evaluations has been completed, taking into account the experience acquired in the process. 8 APPROVED ( ) GOAL:1. OPTIMIZE NATIONAL STRATEGY SPECIFIC OBJECTIVE: A. To have a framework as a guideline of all anti-drug activities. 1. 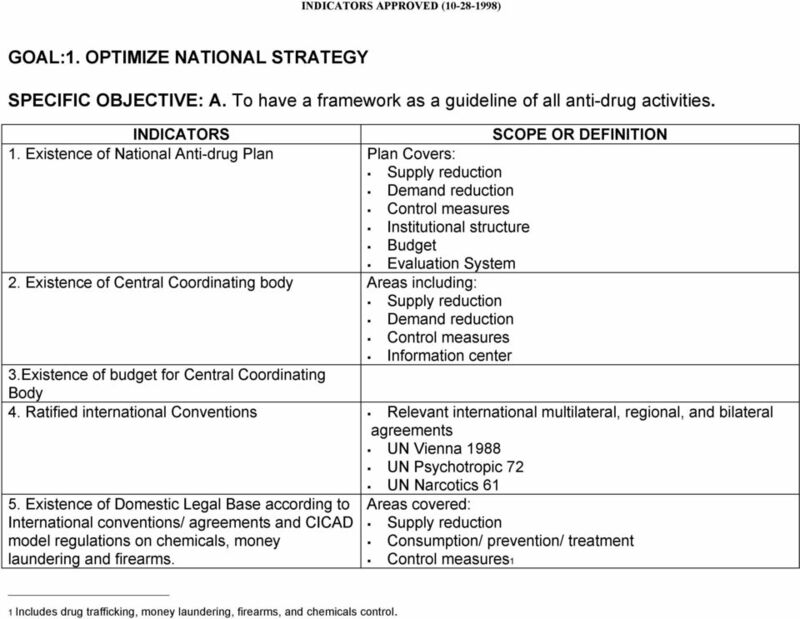 Existence of National Anti-drug Plan Plan Covers: Supply reduction Demand reduction Control measures Institutional structure Budget Evaluation System 2. Existence of Central Coordinating bodyareas including: Supply reduction Demand reduction Control measures Information center 3.Existence of budget for Central Coordinating Body 4. Ratified international Conventions Relevant international multilateral, regional, and bilateral agreements UN Vienna 1988 UN Psychotropic 72 UN Narcotics Existence of Domestic Legal Base according to Areas covered: International conventions/ agreements and CICAD Supply reduction model regulations on chemicals, money Consumption/ prevention/ treatment laundering and firearms. 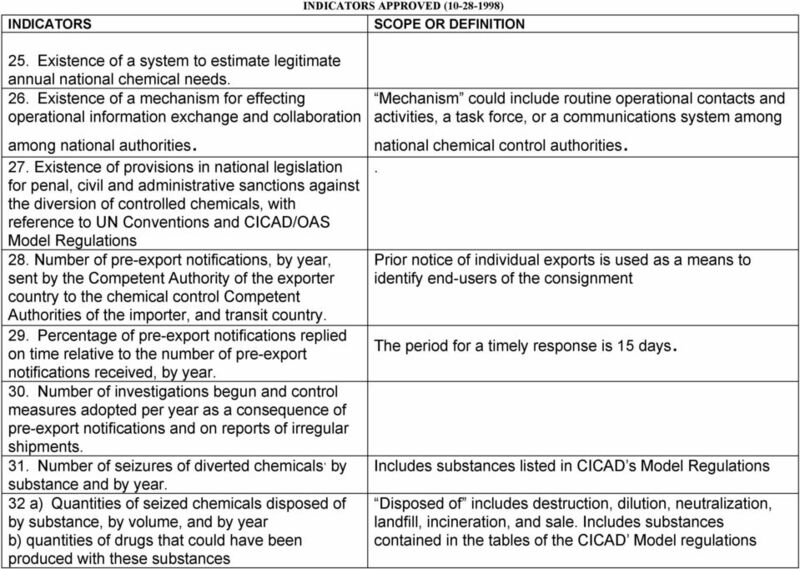 Control measures1 1 Includes drug trafficking, money laundering, firearms, and chemicals control. 9 APPROVED ( ) SPECIFIC OBJECTIVE: B. To have a national system for drug information collection and analysis. 6. Existence of a system of compilation/ maintenance of statistics/ documentation. 7. Existence of a system for the nationwide distribution of drug-related data and documentation. System contemplates: Supply reduction Demand reduction [Including a national standardized system of epidemiological surveys of drug use, as well as qualitative research.] Control Measures Societal impact of illicit drugs. System contemplates: Geographic outreach to urban, suburban and rural areas Procedures, equipment and data transmission components necessary for users to receive their desired types of information. 11 APPROVED ( ) SPECIFIC OBJECTIVE: D. To have a national system of TREATMENT, REHABILITATION and SOCIAL REINTEGRATION OF DRUG ABUSERS that includes different modalities. 13. Existence of guidelines on minimum standards of care for drug treatment established by each member state 14. 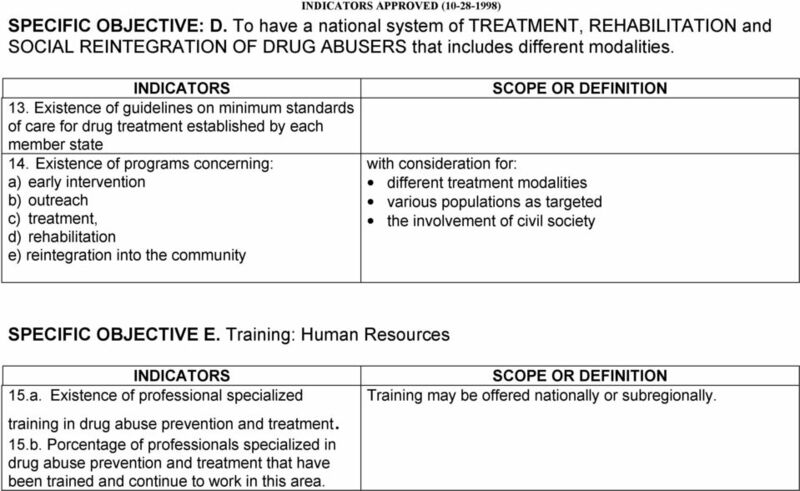 Existence of programs concerning: a) early intervention b) outreach c) treatment, d) rehabilitation e) reintegration into the community with consideration for: different treatment modalities various populations as targeted the involvement of civil society SPECIFIC OBJECTIVE E. Training: Human Resources 15.a. Existence of professional specialized training in drug abuse prevention and treatment. 15.b. Porcentage of professionals specialized in drug abuse prevention and treatment that have been trained and continue to work in this area. Training may be offered nationally or subregionally. 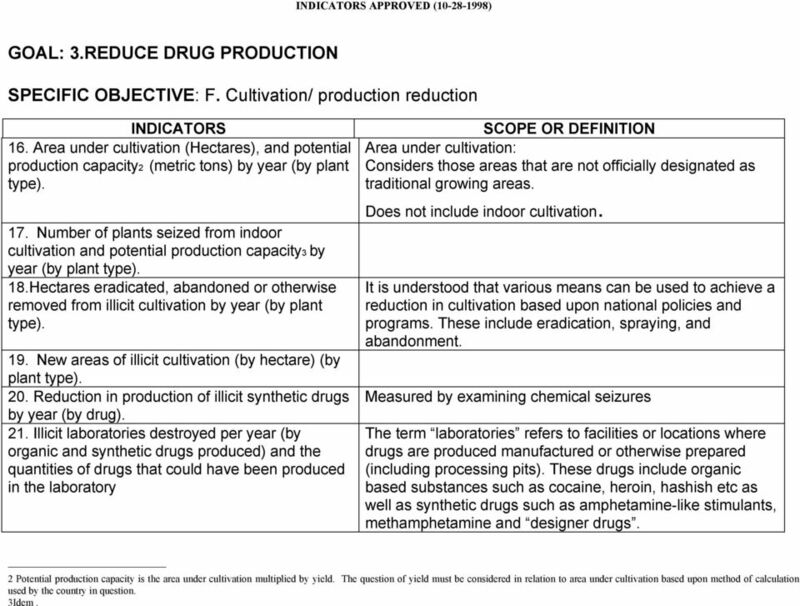 12 APPROVED ( ) GOAL: 3.REDUCE DRUG PRODUCTION SPECIFIC OBJECTIVE: F. Cultivation/ production reduction 16. Area under cultivation (Hectares), and potential production capacity2 (metric tons) by year (by plant type). 17. Number of plants seized from indoor cultivation and potential production capacity3 by year (by plant type). 18.Hectares eradicated, abandoned or otherwise removed from illicit cultivation by year (by plant type). 19. New areas of illicit cultivation (by hectare) (by plant type). 20. Reduction in production of illicit synthetic drugs by year (by drug). 21. Illicit laboratories destroyed per year (by organic and synthetic drugs produced) and the quantities of drugs that could have been produced in the laboratory Area under cultivation: Considers those areas that are not officially designated as traditional growing areas. Does not include indoor cultivation. It is understood that various means can be used to achieve a reduction in cultivation based upon national policies and programs. These include eradication, spraying, and abandonment. Measured by examining chemical seizures The term laboratories refers to facilities or locations where drugs are produced manufactured or otherwise prepared (including processing pits). These drugs include organic based substances such as cocaine, heroin, hashish etc as well as synthetic drugs such as amphetamine-like stimulants, methamphetamine and designer drugs. 2 Potential production capacity is the area under cultivation multiplied by yield. The question of yield must be considered in relation to area under cultivation based upon method of calculation used by the country in question. 3Idem. 15 APPROVED ( ) 33. During the last year, the number of requests made for international cooperation on chemical control under international agreements and the number of positive replies Includes international cooperation such as multilateral and bilateral maritime/ riverine agreements, mutual assistance agreements and MOU s. SPECIFIC OBJECTIVE: I. Chemical Substances Control: Training 34. Percentage of officers trained in chemical control that continue to work in this area. These 40 countries reported 3,657 drug seizures with a total quantity of 17.014 kg of seized illicit substances. SIGNATURES AND CURRENT STATUS OF RATIFICATIONS AMERICAN CONVENTION ON HUMAN RIGHTS "PACT OF SAN JOSE, COSTA RICA"
Admission to UNICAMP. 1. The Undergraduate Program. 1.1. Regular students. 1.1.1 The vestibular examination. 1.1.2.